Dave Wong’s Training Crew from left: Steve Arthur, Paula Steger, Dawn Grout, Richard Shine, Bob Burton, David Wong and David Lawell. Missing from photo is Larry Kraus. Picture taken by Sue Sherwood. Training is always one of the biggest issues of any endeavor in a person’s lifetime. It starts almost at birth, and it is always a big dilemma as to which path is correct. Parents, bosses, any leader agonizes over the correct way to train a new participant in any of life’s activities. Proper training insures success, so what could be more important than training? Any good training program follows a designed set of plans for the learning process of the activity. 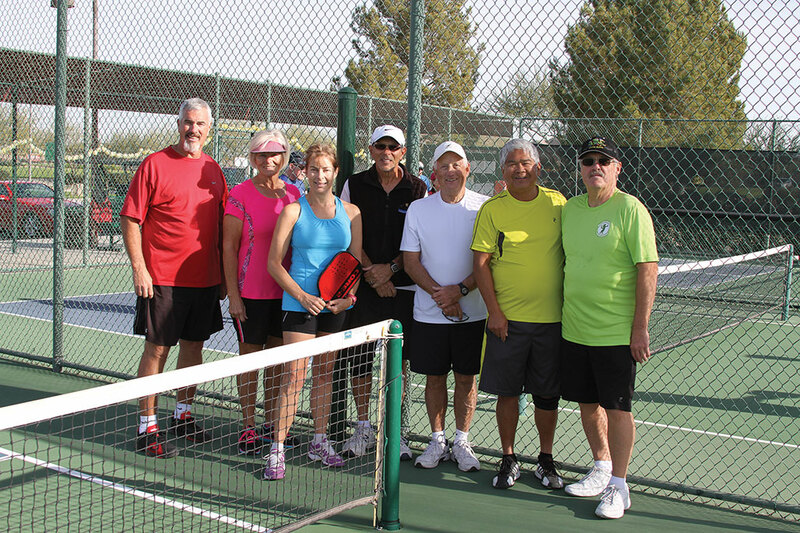 Our Pickleball Club has that process planned and executed quite nicely thanks to Dave Wong’s time and efforts. Dave has designed a more “formal” plan to give our residents their introduction to the game of pickleball. And the great thing is that lessons are free! Dave and his volunteer trainers start the plan with an overview of the game and rules, and then follow with hands-on basics of play. Once the basics are covered, drills (ugh!) are introduced to raise the new players’ skill level. The next step is to actually test the skills in actual competition with round robin play. As the beginners progress, then Steve Arthur and Paula Steger help the players gain even more competence with new and harder drills. This process is needed to give the player confidence and ability to compete with their fellow players in the round robins. Dave stresses that one of the most important points when playing pickleball is safety. Play under control so that an injury does not happen. As players get better and want help improving their game further, Larry Kraus has volunteered to help with more advanced training skill and drills. Larry’s clinics and drills show on the schedule on Fridays, but it is suggested talking with Larry about setting up any sessions with him. Congratulations to all our members who played in the eighth annual Voyager Holiday Open Skill Level Tournament in early December. Those players are Brenda Amans, Sue Sherwood, David Amans, Mike Campbell, Charlie Forbush, Al Hager and Doug Kant. Medal winners from that group are David Amans and Mike Campbell earning a silver in Men’s 3.5 doubles. Al Hager picked up three medals: gold in Men’s doubles 4.5-5.0, gold in Mixed Doubles 4.5-5.0 and silver in Men’s doubles 5.0. This fall and winter’s fundraiser has done quite well. This year’s project was giving to the Eloy Fire Department Christmas Program, the proceeds of which help the Fire Department feed and clothe local families in need. The total proceeds of our fundraising will be in the neighborhood of $1,000 or more. Thanks for making our effort a big success! The apron prizes were not needlepoint but embroidery, which was crafted by Veronica Long. And lastly, I am very sorry that Mickie Storckman was omitted as a very hard working member of the Social Committee.